Though most of us detest Saturdays spent washing and folding, one mom knows that for those who go without, laundry can truly be a luxury. Close to 70 people came to a London, Ontario laundromat last month to do three hours worth of laundry -- for free. For the Love of Laundry, a social good startup based in London, has been hosting the events since 2014 to help families in need. The project started when Power began making her own natural laundry soap, to help her family save money. Whenever she had a surplus of the soap, she would donate to social service agencies. “But I soon came to realize that if you can't afford to go to the laundromat, having free laundry soap doesn't make any sense,” she told HuffPost. 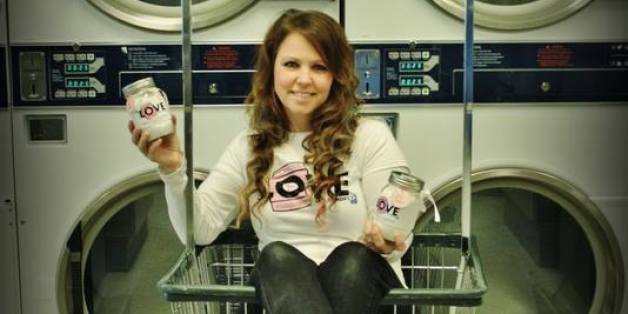 So, she started selling her product to local grocery stores, and from those proceeds, began paying local laundromats to allow people in need to use their machines for free. "One mom told me that with the money she saved, she can finally take her kids out for dinner, something she's never been able to do before," Power said. Currently, For the Love of Laundry events take place exclusively in London, but Power hopes with additional funding, the program with expand to other cities.